Today the CBJ announced that they had signed David Savard to a 5 year contract extension for $21.25 million following a break out year for the young defenseman. Savard scored 11 goals in 2014-15, tying Jamie Heward (now there's a blast from the past!) for second most goals by a defenseman in franchise history. Heward scored his goals in 2000-01, showing just how low the bar is set. But this should not detract from his accomplishment. Savard's biggest accomplishment however, is being able to skate with Jack Johnson when Jack is out there munching minutes. While arguably the Fedor Tyutin - Jack Johnson pairing might be a bit more solid, Johnson skates all the tread off of Tyutin's tires by the end of the season. It's a lot healthier for Toots if he doesn't try to match minutes with Jack. So Savard's accomplishment is significant. 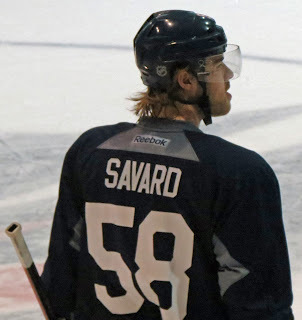 This is an accomplishment for our drafting and development system as Savard, selected 94th overall in 2009, has blossomed into an NHL defenseman. Which is really cool, when you reflect on some of the failures of this system early in the franchise's history, when the dearth of talent was so acute that young players were pulled in before they were ready. Cody Goloubef and Dalton Prout are products of the same system, and the reality of this season is that we can go as far as these later round defensive draft picks of ours can take us. The better these guys play, the less pressure there is on guys like Ryan Murray to carry the defense. Boy, this team better be good, because they are all going to be around for a long time. Our aspirations to make some noise in the playoffs really come down to the height of Savard's, Goloubef's and Prout's respective development ceilings. If all three continue to develop consistency that comes with experience along with their game at the NHL level, then Jarmo's determination to take a shot with this defense will be rewarded. The season looms. I can hardly wait.